Dean's Cards is currently scheduling appointments to meet with sellers at the NSCC show. Dean and his gang will be in Chicago for 2011 National Card Collectors Convention on August 4th and 5th and we are looking to buy just about any card from 1869 to 1969. 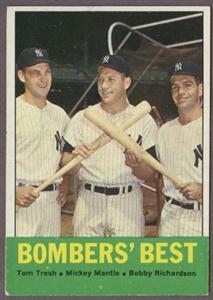 With over one million vintage cards for sale, Dean’s Cards sells more vintage cards than any other dealer. To do so, we must buy a lot of cards. Dean’s Cards buys over 500 vintage collections each year and is looking to add to that number in Chicago this summer. What you may not know is that we do not set up a booth at the show and buy collections by appointment only. In order to book an appointment to sell your collection in Chicago please email orders@deanscards.com or call us at (513) 898-0651. We look forward to meeting with you in Chicago. Being that Father's Day is this weekend, Dean's Cards.com would like to recognize the special bond between father's and their sons, which is undoubtedly been a key ingredient in the growth and popularity of America's pastime. While it's often our father's that will teach us the game, their have been over a hundred uniquely lucky dad's who have also shared their major league talent with their sons. Today, we will take a look at a few of them. 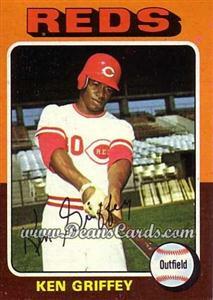 Ken Griffey Sr. and Jr. were not only both lucky enough to put on major league uniforms, they actually had the opportunity to put on the same uniform and play the outfield together. And on one special night during the 1990 season, they combined to hit back to back home runs. Along with the Griffey's, Tim Raines and Tim Raines Jr. are the only other father son duo to play for the same team. While Ken Griffey Jr. was perhaps best known for hitting home runs, no father-son combination hit as many as Barry and Bobby Bonds: combining for a total of 1,094 home runs. Also, the pair combined for 975 stolen bases, so we think it's safe to say that speed runs in the Bonds family. When it came to preventing home runs, one of the best father-son duo's were Mel and Todd Stottlemyre. In 11 years as a Yankees, Mel won 164 games, struck out 1,257 batters and pitched 152 complete games. 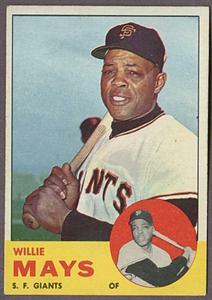 His son Todd struck out 1,587 batters and won 138 games over his 14 year career. Mel Stottlemyre Jr. also pitched in the big leagues and had 14 strikeouts. The three Stottlemyre's combined for 3,158 strikeouts, more than any other father-son combination. 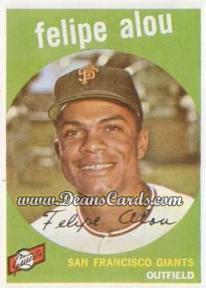 In terms of major league experience, it's difficult to match the the Alou family. The father-son combination of Felipe and Moises Alou paired up to appear in more than 4,000 games in the Major Leagues. The Alou family spent a lot of time on the base too, as each was able to collect more than 2,000 hits. Although the vast majority of father's and sons combinations never experience the game together as these families do, most share the game at some point. It's our dad's who teach us how to play and take us to our first games. They play catch with us and buy us our first baseball cards. Without our these special men we call dad, the game of baseball wouldn't be nearly as cherished as it is. Let Dean's Cards be the first to wish all the dad's a very special Father's Day. Today, Dean'sCards.com received some welcome visitors to our office. A crew from Fox Sports Ohio and Cincinnati's local Fox affiliate stopped by to learn more about our us and the hobby we love. Of course, we're more than happy to share a few of the finer items in our inventory and how we make it all come together everyday. The upcoming segment will offer a chance to meet Dean and he takes the viewer into our card warehouse for an up close look at some of the finest items we have in our deep inventory of cards. 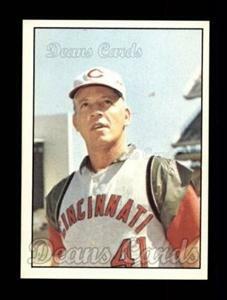 Dean is very excited to share his love of card collecting with all the Cincinnati Reds fans who will be watching. The upcoming segment will air soon on local channel Fox 19 as well as during the pregame of an upcoming Reds Broadcast on Fox Sports Ohio. We are very grateful for their interest in the hobby and their generosity in creating the piece. Stay tuned to the blog as we will share the upcoming story with as it airs. 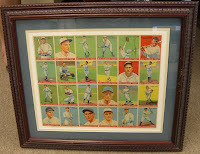 For more information on collecting cards and a deeper look into our inventory, please visit Dean's Cards.com. Today baseball fans can celebrate a very peculiar anniversary. 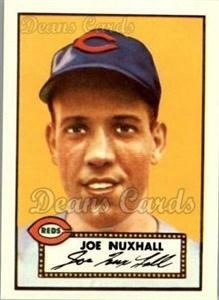 On this day seventy-seven years ago, Joe Nuxhall became the youngest player to play in a modern era major league baseball game- at the ripe age of 15 years old. During the ninth inning of a 13-0 rout at the hands of the St. Louis Cardinals, a boy six weeks shy of his sixteenth birthday, was called from the bullpen for mop up duties and retired the first batter he faced. But the rest of the inning didn't go as well. Unable to escape the ninth unscathed, Nuxhall faced walked five batters, gave up two hits, threw one wild pitch and five earned runs. He faced nine batters, retiring two, before the Reds were forced to bring in Jake Eisenhart for the final out in the ninth. Needless to say, Nux had better days on the job over the next 60 or so years of his career, both as a Reds player and then broadcaster. 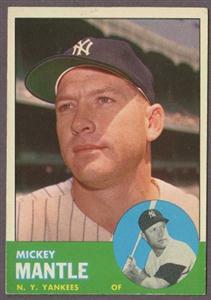 Like a lot of collectors, we here at Dean's Cards.com find it very fascinating to look back on the careers of our favorite ballplayers through their baseball cards. Interesting, despite pitching in a game in 1944, Nuxhall didn't immortalized on a card until the eight years later in 1952. Perhaps he couldn't get the time off from high school. Unfortunately for collectors, that day didn't come until the still fresh-faced Nuxhall debuted his 1952 Topps #406 rookie card. As a seasoned veteran approaching the end of his playing career in 1978, Nuxhall did finally look a little different than he did as a boy who left his unique mark on history. To take a journey through the careers of your favorite players through their cards, please click here. When Topps issued their Civil War News card sets in 1962, the centennial celebration of the Civil War was still in full swing. The set consists of 87 picture cards and a checklist card, which were distributed nationwide in nickel packs. Also, inserted in the package were replica bills of Confederate Civil War currency. There were 17 types of bills in total. The Civil War News card fronts featured scenes from many of the well-known Civil War battles, hand painted by a combination of two artists, Maurice Blumenfeld and Norm Saunders. 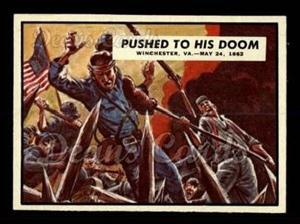 The card backs featured a synopsis of the scene being portrayed on the card fronts, and were meant to look like newspaper articles, and always featured the “Civil War News” header. This header ultimately gave the card set its name, although the set was never intended to be titled Civil War News, as the wrappers and boxes never had “Civil War News” printed on them. 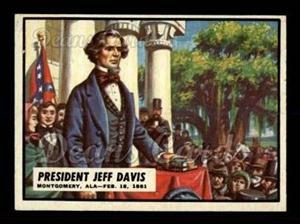 While there are a few cards in the set that depict famous Civil War speeches and non-violent events, such as card #2 President Jefferson Davis, the majority of the cards depict graphic events. With titles such as “Exploding Fury” (Card #5), and “Flaming Death” (Card #65), these cards were highly popular amongst kids, but much less popular amongst their mothers. While a great deal of Civil War artwork tends to romanticize bloody battles and victories, the Civil War News cards hardly hold back. Len Brown and Woody Gelman, the masterminds behind the set’s creation, grew up collecting the famed 1930’s Horrors of War cards. Thus the duo created a graphic set of cards, rivaling Gum, Inc’s earlier set in terms of grotesqueness. 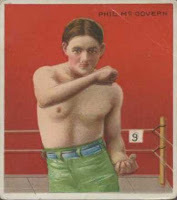 Both men felt that the graphic nature of the cards added to the success of the cards, as neither Len nor Woody felt that the cards would sell well with young boys if they were “too educational”. Here at DeansCards.com we’ve had a lot of Civil War News cards come through the door, including a PSA Registry set that averaged 7.31 in condition. The most expensive cards in the Civil War News set are the first and last cards—because they are very condition sensitive. These cards would have been on the top (or bottom) of a card stack, and generally took the brunt of any damage done to the card sets. Thus collectors may have to pay quite a bit more for “The Angry Man” (Card #1), and the Checklist card (Card #88) in pristine condition. The Civil War News cards remain a favorite with today’s collectors, although fewer seem interested in currency bills that came with the set as inserts. For the last two years, Civil War News has been the #1 selling non-sports card set at Deans Cards.com in both the number of cards sold and total dollar amount. 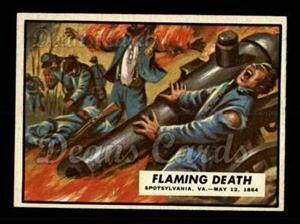 Although there are more high-profile non-sports card sets, such as “Horrors of War” and “Mars Attacks”, Civil War News cards are a much more affordable option for collectors, with the timeless and interesting subject matter of the American Civil War. 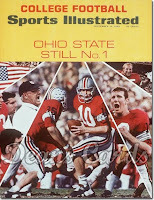 One of the most captivating sports stories of today is unfolding away from the playing field, about 100 miles north of Dean's Cards headquarters, on the campus of The Ohio State University in Columbus, Ohio. Once the pride of an entire state, the University's storied football program is now struggling through the one of its darkest chapters. However, according to recent investigative work by Sports Illustrated, the programs' troubles began while its sun was still shining brightest. Consequently, today's Ohio State is marred by a layered and complex eligibility scandal and is forced to live with an ugly scarlet and grey scar that results from the transgressions of a few individuals. For better or for worse, Sports Illustrated has been around to chronicle sports' most important stories, while preserving a permanent place in history for them. Ohio State's football program should know this as well as anyone. 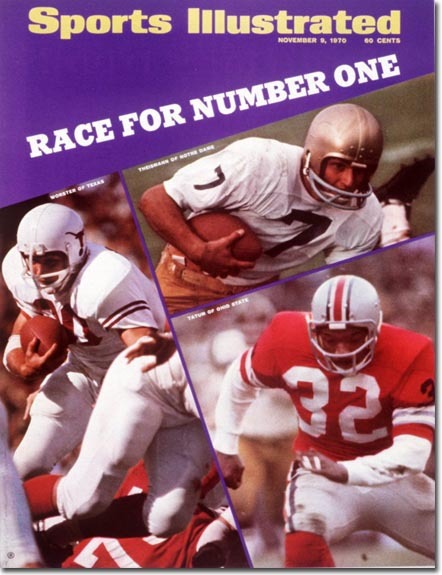 Sports Illustrated has chronicled the dramatic dancing of Ohio State's famed halfback Archie Griffin, the on field heroics of legends like Jack Tatum to the magnificent triumphs of a team overcoming a worth adversary. 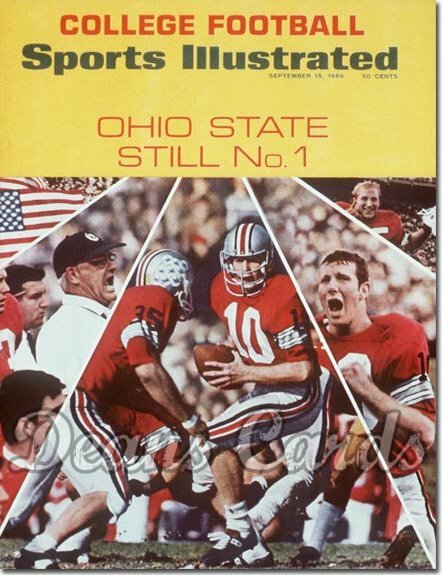 Yet, as Ohio State knows, Sports Illustrated never hesitates to preserve those less than perfect moments as well. Just ask Andy Katzenmoyer and Jim Tressel. Perhaps the most interesting part of history is that it changes over the course of time, providing a unique twist on how we view the past. 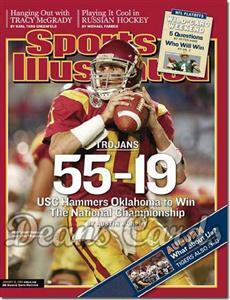 Due in part to its weekly format, Sports Illustrated will often fall victim to a revisionist view of history. 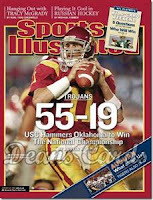 In fact, this week, when the University of Southern California was stripped of its 2004 National Championship in football, an SI cover instantly became something of an oddity. The great part of collecting something is that there is a unique story behind every item. However, collecting Sports Illustrated provides something extra- captured within the collectable is a timeless story that can preserved equally as long. Despite being unable to make a profit in the first 12 years of its existence, Sports Illustrated has been going strong for more than fifty years. Dean's Cards has comprehensive (and soon to be complete) collection of Sports Illustrated's in our inventory. Although the sport of boxing is currently going through a lean time, that certainly wasn't always the case. 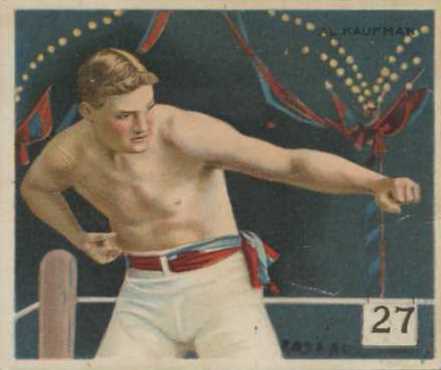 In fact, prize fighting was one of the most popular sports in America. 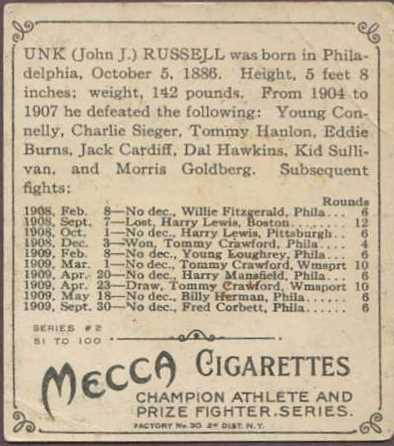 Evidence of this fact are the once popular 1910 Mecca & Hassan Champion Athlete and Prize Fighter Series cards. Fortunately, Dean's Cards was recently able to acquire a handful of them. The 1910 Mecca & Hassan Champion cards were issued by tobacco manufacturers as both a tactic to promote their brand as well as serving as a valuable piece to the packaging. The inserted card would give structure to the loose packaging that the cigarettes were wrapped in. Another famous example of a tobacco card is American Tobacco Company's T206 Honus Wagner. However, the T218 Mecca & Hassan Cards have a lot of really great features. Perhaps the most striking feature of the Prize Fighting collection is the beautiful color artwork of the cards. The full color images are set in front a bold background and set inside of a white border. The rich colors that fill the cards are particularly enjoyable because they're an excellent example of colorized photos, a technique used before the invention of color photography. Another cool characteristic of the T218 cards is the level of detailed information printed on the back of the cards. They include a paragraph biography of the prize fighter as well as a recapped listing of his bouts; including their date, the opponent, the result and the length of the bout. Another unique hallmark of the 153 card Mecca & Hassan Champion Athlete & Prize Fighter collection is that they included champion athletes from a wide array of the day's most popular sports, including aviation, track & field, swimming, billiards, golf and even roller skating. 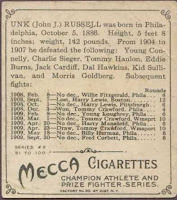 Without a doubt, the 1910 Mecca & Hassan cards are a lasting mark of a very different time in America's sporting life. Please click here to fill out the rest of your boxing card collections. It's Monday and we need you're help. This morning at Dean's Cards we came across a couple of interesting baseball cards that got us thinking- what is most number of players depicted on a card that isn't an entire team card? Our reason for asking this question today is this morning we stumbled over two distinct cards from the 1993 Upper Deck series with five players each on them. Oddly enough, both of those cards feature players representing teams from the Buckeye State. 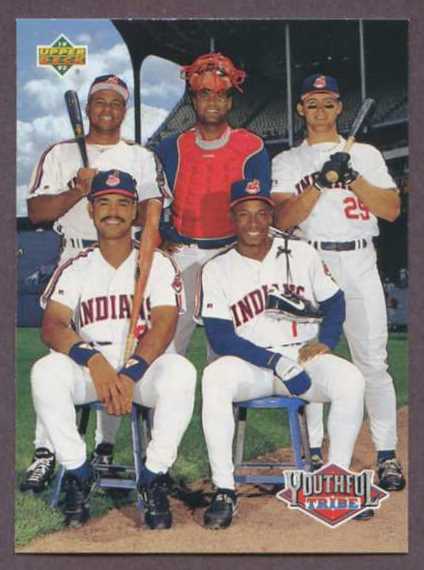 The first card we noticed was #45 with Cleveland Indians teammates Albert Belle, Sandy Alomar Jr., Jim Thome, Carlos Baerga and Kenny Lofton on it. 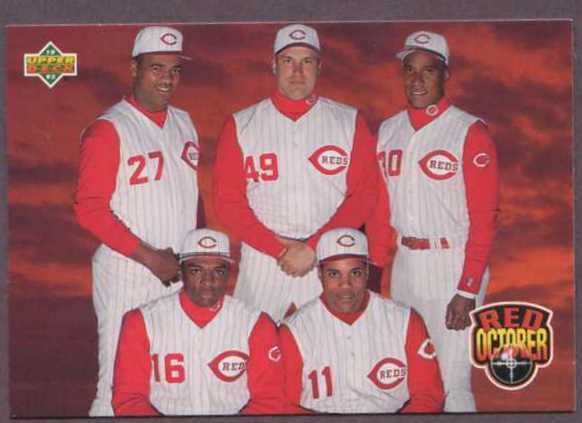 The second is card # 473 with Jose Rijo, Rob Dibble, Barry Larkin, Reggie Sanders and Roberto Kelly representing our hometown Reds. Do you have any cards in your collection that depict more than five players on them but are not team cards? If so, we would love to hear about them in the comments section below. If not, happy card hunting from Dean's Cards.com. The best thing about owning a card store is that you never know what is going to come through the door or who you are going to get to meet. Recently a local guy came into the office and brought us about 500 UncleSam/Home Defense cards, as well as a complete set of cards #1-120. DeansCards.com buys well over 500 collections a year, but this one was particularly fun for me because the seller told me about collecting the cards as a 8-year-old and his impression of World War II as a boy..
With the success of their 1938 Horrors of War set, Gum, Inc decided to issue yet another war-themed, bubble gum card set. Thus in 1941, Uncle Sam & Home Defense cards first appeared on the market. These small cards measured 2 ½” by 3 1/8”, and were issued in two separate subsets. 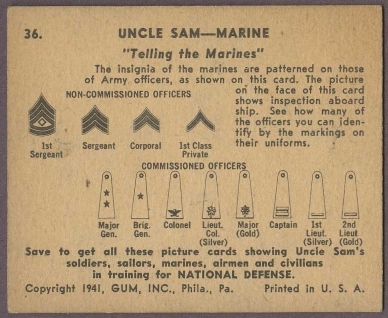 The “Uncle Sam” set was issued first, and is comprised of cards #1-96, while the “Home Defense” set followed, as it consisted of cards numbered #97-144. 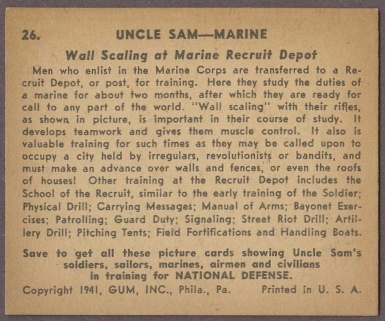 The “Uncle Sam” set focuses on the United States’ four military branches: the Army, Navy, Air Force, and the Marines. 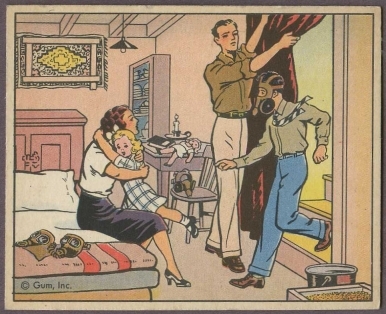 With this set, Gum, Inc. decided to focus less on the atrocities of war (much like they did in their Horrors of War and War Gum sets), and instead focused on the vigilance of the U.S. in the face of warfare. With that said, kids and collectors often shied away from this set, which they deemed bland and boring compared to the other popular sets of the day. 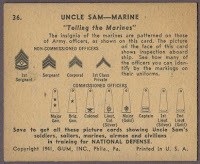 “Bland” as it may be, the “Uncle Sam” set proved to be very useful with the imminence of America’s entry into the war overseas. 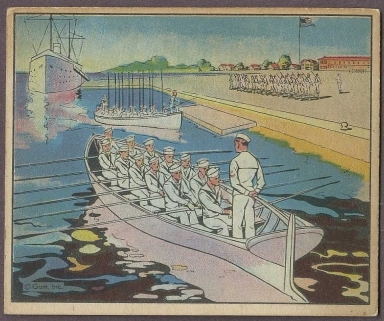 The artwork on the cards in this first series was reproduced in two books entitled “America’s Army” and “America’s Navy”, published by Rand McNally in 1942. The cards also sparked patriotism, as storeowners hung sheets of uncut cards in their windows to show their American pride. Planters Peanut’s produced premium booklets which featured illustrations of the cards as well. The second half of the set, the “Home Defense” portion, is more costly to collect when compared to the “Uncle Sam” cards. As the “Home Defense” cards rolled off of the printing press, Americans were being sent off to war. Thus the paper and ink used to make the cards was rationed for the war efforts, resulting in fewer cards made. Cards numbered 97-120 cost on average twice as much the first 96 cards in the set, while the final 24 cards in the set cost hundreds, if not thousands, of dollars to collect. Although the war was confined to the continent of Europe when the Home Defense set was issued in 1941, many Americans feared violent attacks would occur here on US soil. 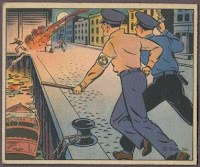 Thus the 48 Home Defense cards depicted precautionary activities and measures that must be taken, should an attack be carried out on the US mainland. Card #125, “Individual Defense Against Incendiary Bombs” for example, depicts the proper course of action that women and children should take, should an incendiary bomb be dropped on their homes. Today we count on the internet and televised news programs to keep us abreast on the battles being fought overseas, as well as the proper precautions to take both at home and abroad. However, in 1941, televisions were scarce and the internet was non-existent. 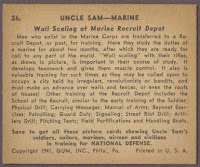 Thus the Uncle Sam and Home Defense trading card sets proved to be useful as well as patriotic to the American masses. While the actual start date of the 2011 football season remains in question, the release date of the 2011 Topps football series is not. Slated to be released later this summer, the 2011 edition of Topps Football will include the return of some familiar favorites like Ring of Honor cards and Rookie Premiere Autographs as well as some exciting new features. Among them are a full color 1952 Bowman insert cards, "Faces of the Franchise" cards, a "Game Day" rivalry collection and cards honoring the "Super Bowl Legends." 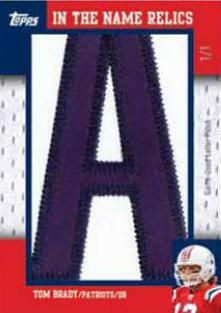 Our personal favorite new feature at Dean's Cards is the new "In The Name" cards which feature a piece of the player's uniform nameplate in the card. The standard 440-card set will be comprised of football veterans, rookies, NFL team cards, Pro Bowlers and cards capturing great playoff moments; however each standard hobby box will include one special insert card. To fill out the rest of your football collections, please visit Dean's Cards. Just yesterday, we at Dean's Cards had the great fortune of having a very interesting piece of memorabilia walk through our doors- a 1933 World Wide Gum Uncut Sheet of cards. 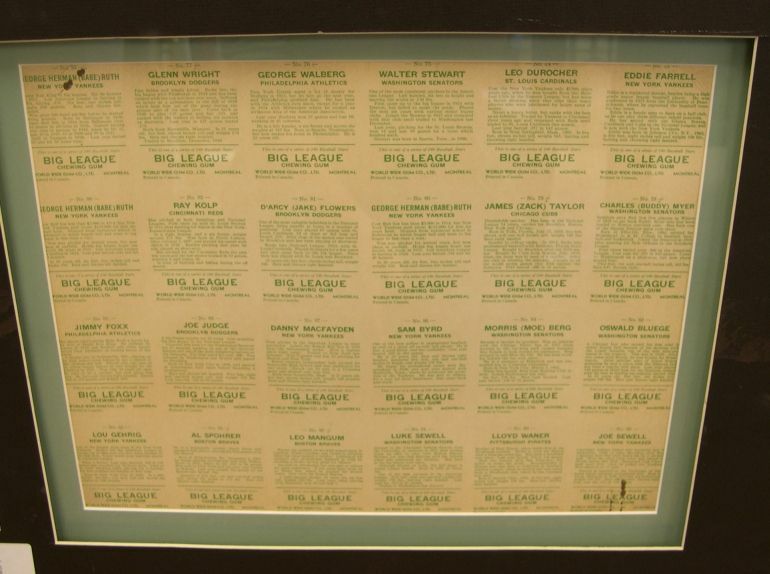 This extremely rare uncut sheet of Pre-War cards features names equally rare among collectors; including Jimmie Foxx, Lou Gehrig and three Babe Ruth cards (two #80 cards and one #93). In fact, until we're proven otherwise, we're going to believe this product is absolutely one-of-a-kind. The World Wide Gum set is commonly viewed as the Canadian brother to the American Goudey brand and occasionally features both English and French languages. However, our prized 1933 uncut sheet is in World Wide Gum's more standard English only. With no other branding on the cards, the giveaway that the cards are from World Wide Gum is the "Printed in Montreal" markings on them. 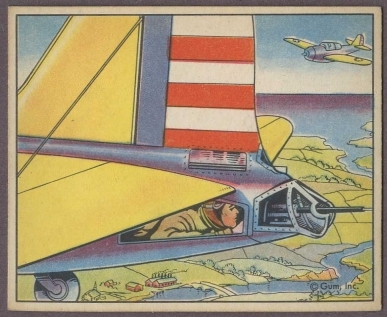 To view the ever-beautiful 1933 World Wide Gum Uncut Sheet, please click here.